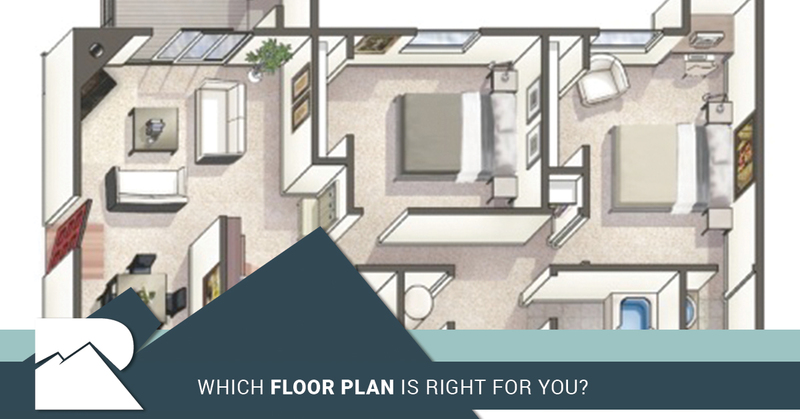 Which Floor Plan Is Right For You? One of the hardest things about starting an apartment search is finding a place with a layout that works well for your specific needs. The good news is that at Summit Riverside Apartments, we have a number of different floor plans for studio apartments, 1-bedroom apartments, 2-bedroom apartments, and even loft apartments. No matter what you’re looking for, we think you’ll find that our luxury apartments will fit the bill. We strive to create living spaces that people will actually enjoy living in — after all, we live in a beautiful city inside of the best state in the country and our living spaces need to reflect that! That’s why in today’s post, we’d like to take a look at some of the different floor plans we have available. If you’re looking for a place to live in Littleton, Summit Riverside Apartments might just be the perfect place for you. Keep reading to learn more! Perhaps you’re looking for a studio apartment because you prefer to live in a space that’s comfortable and cozy. If that’s the case, our Crystal floor plan is perfect. It’s a 600 square foot studio apartment with loft space that would be perfectly suited for a comfy bedroom. Maybe you’d prefer a 1-bedroom apartment with its own 10’ x 10’ bedroom. The Rio’s the way to go. Need some extra space? The 864 square feet in the Poudre are perfect with its 2 bedrooms and 1.5 baths. You might be the type of person that needs a 1-bedroom apartment, but you’re also in need of a dining room and a deck. The Gunnison model is perfect! As we mentioned above, there really is something for everyone. No matter how you use your living space, you’re sure to find the perfect option at Summit Riverside Apartments. At the end of the day, we know that you have plenty of options for where you’ll live in Littleton, but our goal is to provide each and every one of our residents with a space that’s usable. No matter what your specific needs are, be sure to take a good look at our floor plans because you’re sure to find the perfect combination of features that will suit your unique needs. With full-size washers and dryers, designer flooring, plush carpeting, patios or balconies, walk-in closets, stainless steel appliances, central heating and air, and much more, you’ll find that living here is a win/win situation. Each and every one of the apartments we have for rent is designed with actual people in mind. All too often, apartment complexes seem content to try to cram as many apartments into a space as they can, but we strive to ensure that people have plenty of options. Your life isn’t cookie cutter, and neither are our apartments. There’s also plenty to do nearby. Do you like to spend your free time outside? You’ll be stoked to hear about the many nearby nature trails. If you enjoy working out, you’re sure to love our 24-hour fitness center so you can take care of yourself no matter the time of day or night. Want to relax? Take a dip in our outdoor heated saltwater pool, shoot some hoops at our full-size basketball court, or grab a cup of coffee at our internet cafe. We should also mention that our apartments are pet friendly! That means that you don’t have to worry about whether or not you can bring your four-legged friend with you. We’re even working on a Bark Park that will be opening in the very near future. It doesn’t get much better than that! The only way to really know if our apartments are right for you is to schedule a tour and see for yourself. We’d be glad to show you around to help make sure you find that one that’s right for you! At Summit Riverside Apartments, we strive to provide our residents with apartments that they’ll be truly happy in. There’s a lot to love about living in Littleton, and we’re confident that you’ll love life at our apartment complex. Reach out today, because we look forward to hearing from you!